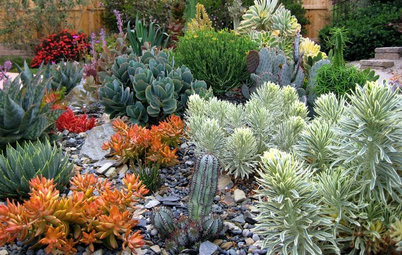 Succulents are the darlings of the horticultural world. 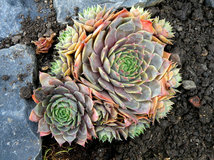 Imaginative displays in nurseries and garden centers tempt us to create a succulent masterpiece of our own. 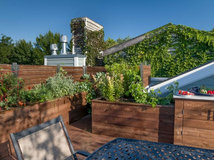 Yet with so many shapes, sizes and colors to choose from, the idea of designing a container garden can be intimidating. 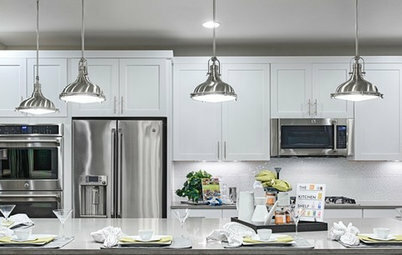 Which plants look good together? How many do you need? And then there is the container. A simple wooden crate or a moss-filled frame? Perhaps a hypertufa basin or an old hiking boot? 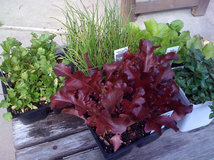 Certainly the plants will grow in all of these, but some are easier to work with than others. Let's keep things simple and fun. 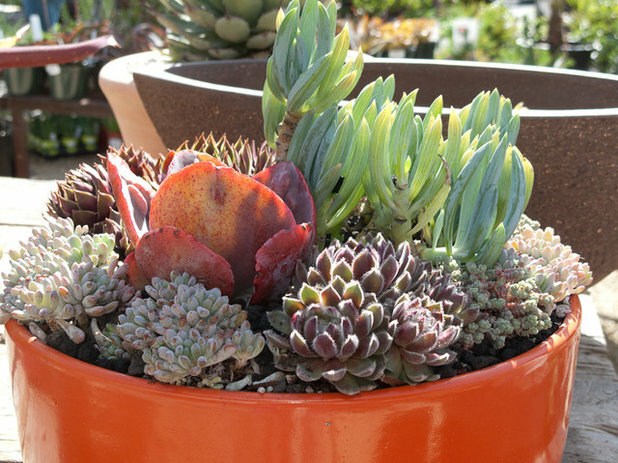 Bold color, strong shapes and just a few plants are all you need to quickly put together an eye-catching succulent container garden. 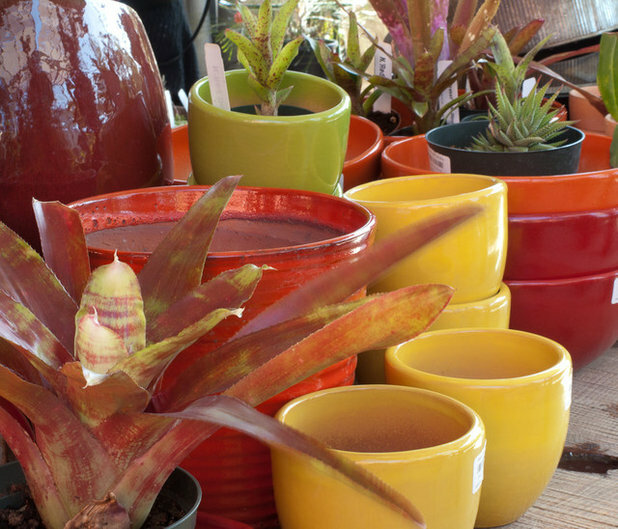 Select a brightly colored pot; choose something fun. If you like the pot when it's empty, you'll love it when it's planted. Here in Seattle, the skies are gray for more than half the year, so I'll take color wherever and however I can find it. 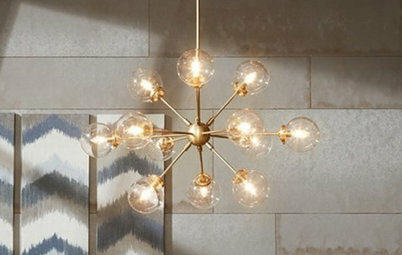 Those who live in sunnier regions will still appreciate making a strong color statement that won't wash out under the glare of an August sun. 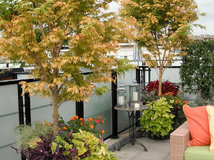 All but one of the containers featured in this ideabook are glazed ceramic. 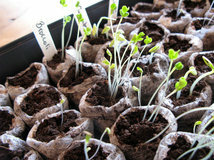 This is nonporous so the potting soil does not dry out too quickly. 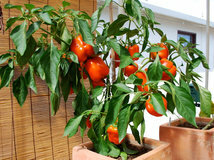 Ceramic pots are available in a wide range of colors, shapes and styles. 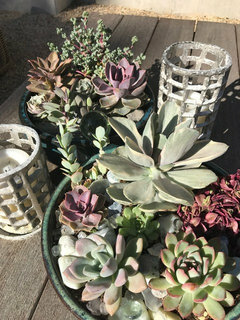 I prefer to use containers with no pattern or embellishment for succulent design, to keep the focus on the textures of the plants themselves. Consider the shape of the pot. 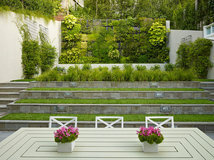 A dramatic pairing of pot and plant becomes a living sculpture in the garden. There is no right or wrong shape of container, but do experiment with different options. 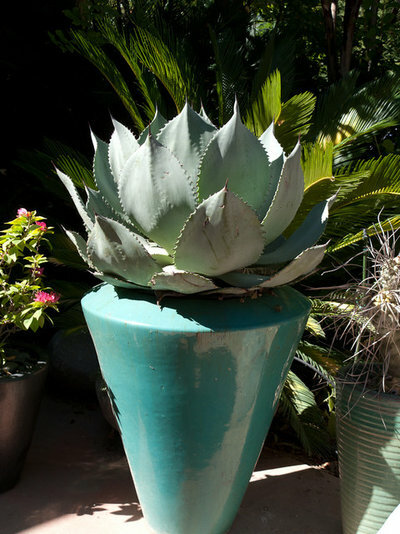 Although this agave would look equally stunning in a wide, low bowl, the unique shape of this teal container adds an element of drama. In contrast, this donkey tail spurge (Euphorbia myrsinites) looks just right tumbling out of a shallow, rustic blue pot. Repeat the container color. 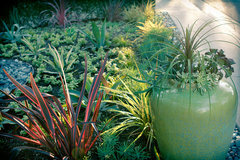 Select plants that repeat the color of the container for a clean, monochromatic and understated design. 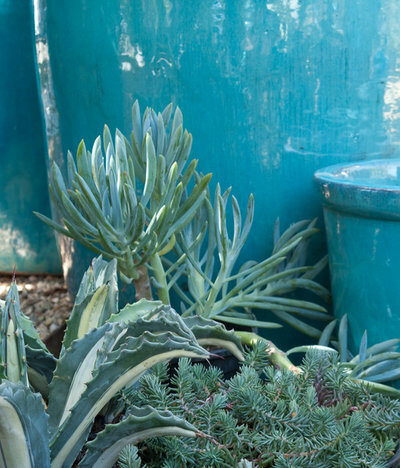 These turquoise pots make a dreamy combination with the blue-toned succulents shown here. 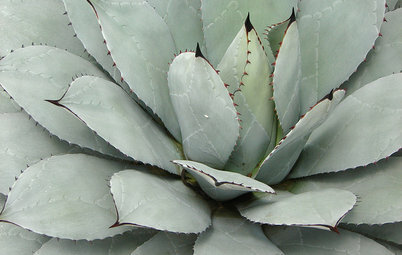 At the left is a wonderful creamy variegated agave (Agave americana 'Mediopicta Alba,' zones 8b to 11). What a great architectural shape, but watch out for those fierce thorns. Slender blue chalk fingers (Senecio mandraliscae, zones 10 to 11) in the center are a favorite of mine for containers, adding a little vertical interest without taking up too much space. 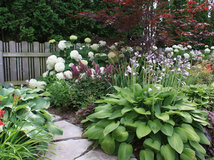 The finely textured blue spruce sedum (Sedum rupestre 'Blue Spruce,' zones 3 to 11) on the right is hardier than the others and looks wonderful tumbling over the edge of a pot. Try using just one plant. Sometimes less is more. 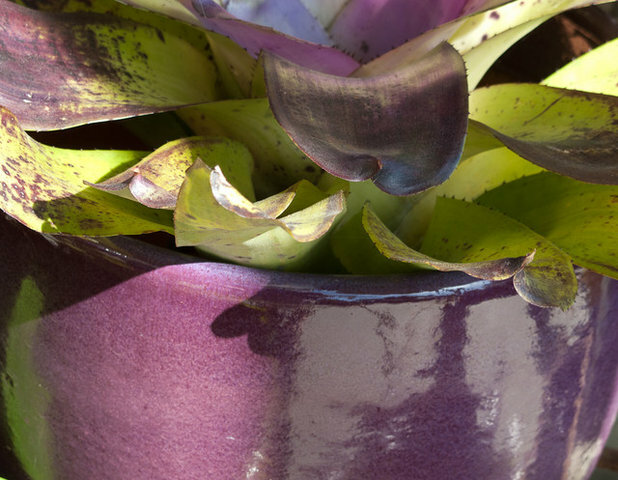 When you find a gorgeous specimen plant, such as this purple and green marbled bromeliad, it needs no companions. 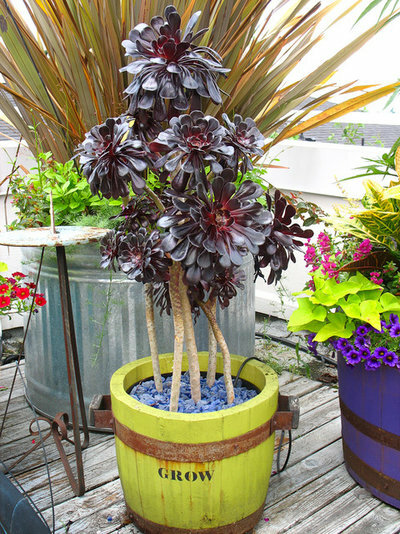 It perfectly matches the color of this pot and its wide, sculptural foliage fills out the container nicely. 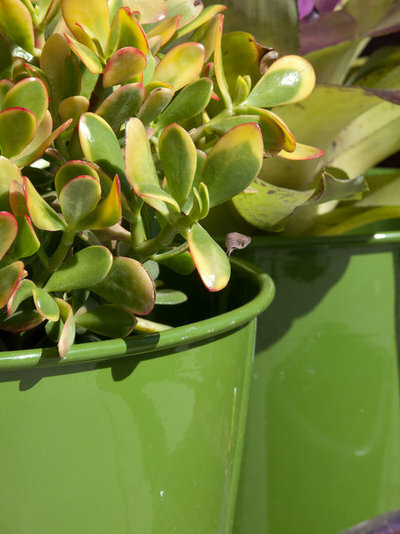 This gorgeous glossy green container looks as though it has been dyed to match the yellow jade plant (Crassula ovata 'Hummel's Sunset'). The olive green tone is repeated, but the plant also has some subtle yellow and orange highlights for interest. 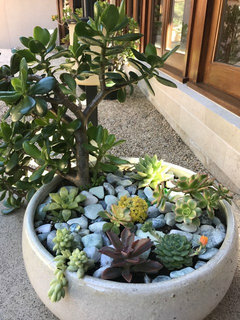 When designing with unique succulents like this, select a size that will completely fill the pot. Adding other plants would be a distraction. Black rose (Aeonium arboreum var. atropurpureum 'Zwartkop,' zones 9b to 11) is a plant with attitude. Juicy black rosettes are held high on spindly "chicken legs," which I usually hide with a tier of lower growing plants. In this whimsical design I decided to play up the fun element, however, and leave the stems exposed. 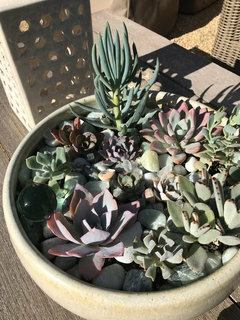 These top-heavy plants can be quite fragile, so rather than planting them directly into the green container I simply slipped the black nursery pot inside and disguised the pot rim and soil with blue beach glass. 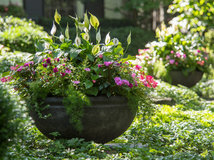 One of the easiest ways to plant a mixed container is to place something tall in the middle and surround it with just one or two different companion plants. 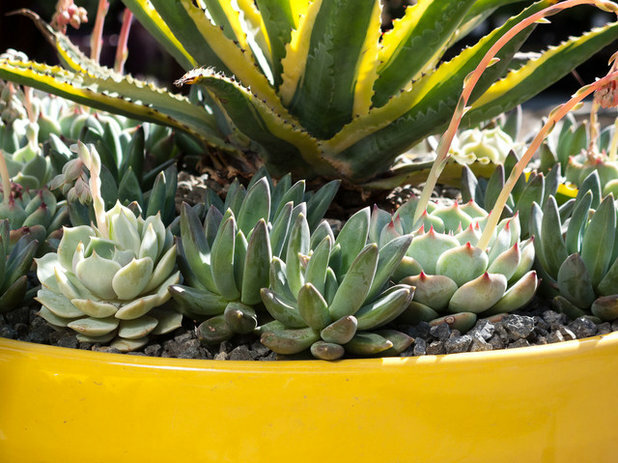 This sunny yellow bowl plays off the color of the variegated agave (Agave americana 'Variegata,' zones 8b to 11). 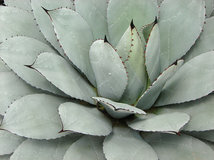 Paler hued echeverias, zones 8 to 11, interspersed with deeper-toned pachyveria (X Pachyveria glauca 'Little Jewel,' zones 10a to 11) form a simple collar, adding interest while maintaining a pared-down simplicity. 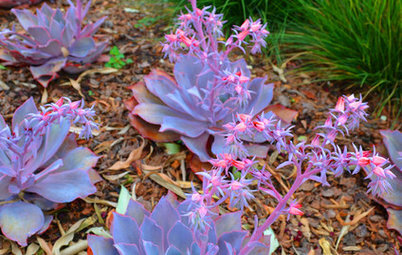 Blue waves echeveria (Echeveria 'Blue Waves,' zones 9 to 11) is certainly decorative enough to stand on its own. 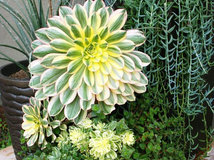 Yet adding a simple froth of soft green burro's tail (Sedum morganianum, zones 9 to 11) at its base highlights the similar hue in the oversized ruffled leaves. 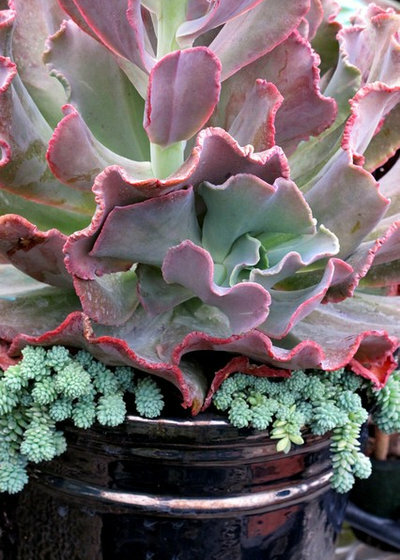 The key plant (sometimes called the thriller) here is not the tallest one, but rather the bright orange carbuncled echeveria (Echeveria gibbiflora hybrid, zones 9 to 11) which repeats the container color so perfectly. 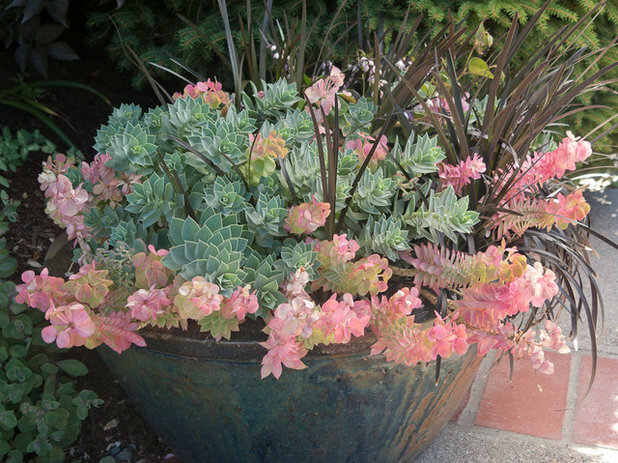 Blue chalk fingers (Senecio mandraliscae) provide height in this asymmetrical design, while an assortment of succulents in russet tones fill in the ground plane. 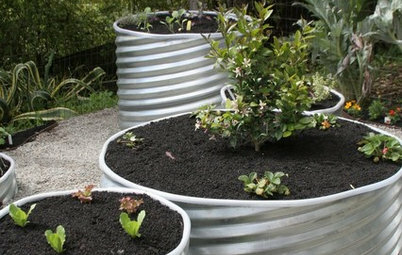 Make sure the container has ample drainage holes. 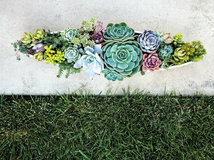 Succulents will rot in soggy soil. 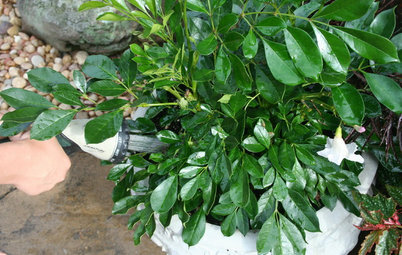 Use a soilless-based potting soil with excellent drainage. Add extra perlite if necessary. 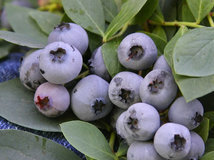 Incorporate a slow-release granular fertilizer when planting. Top-dress with decorative gravel if desired. 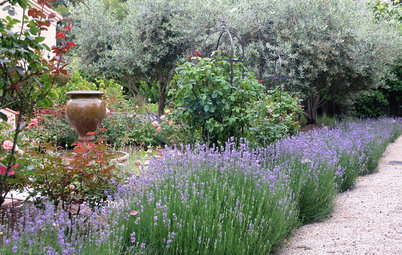 Water once per week at the soil level rather than over the plants themselves. 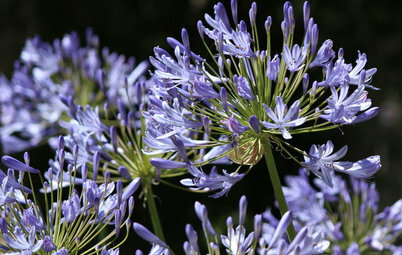 Note: Many of these photographs were taken at Flora Grubb Gardens, in San Francisco, a succulent lover's mecca. 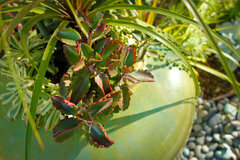 Kobo Round Planter, Black, 18"
Like you I love succulents in pots in a drought tolerant garden. I have a little burro's tail just waiting for a home. Now I know where. 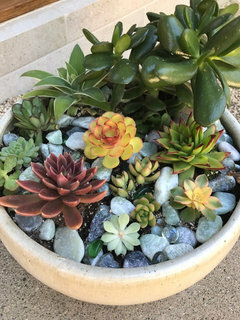 Love the white pot with blush succulents! 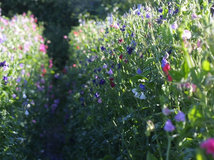 Easy to do, gorgeous to watch grow. 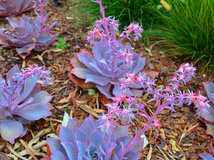 If you are in the Bay Area - The Succulent Garden in Moss Landing is spectacular. Love Flora Grubb too! 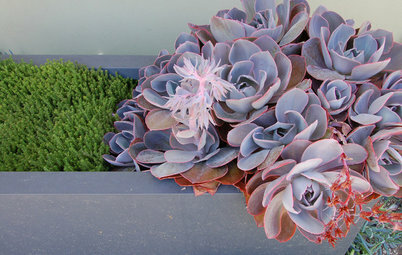 Amazing colors, exuberant blooms, low maintenance ... is it any wonder Echeveria is so popular?